This tutorial was inspired by the incredible Layer Styles available on Envato Market. First of all you have to install the pattern file named ‘green_metal_pattern’. You can do this by double-clicking the icon. Create a New Document (File > New). Set Width to 600 px and Height to 500 px. Resolution must be 72 ppi. Select the background and Duplicate it (go to Layer > Duplicate Layer > OK). Rename the new layer as Background Pattern. To add the texture we are going to use a Layer Style. Go to Layer > Layer Style > Pattern Overlay, select 'green_metal_pattern' from the list, and set the Scale value to 50%. Click on Snap to Origin each time you apply this pattern. To obtain a center light look, go to Layer > Layer Style > Inner Shadow and set the following values. Now we are going to add a reflection. Go to Layer Style > Bevel & Emboss and set these values. You have to create a custom Gloss Contour, so follow the images carefully to reach the desired effect. Type the word Shine or some text of your choice using the Amaz Obitaem Ostrov Italic font. Set the Font Size to 180 pt. For best quality, change the anti-aliasing mode to Sharp. Rename the layer as Shine Top. Duplicate the text twice and rename the new layers as Shine Mid and Shine Bot as shown below. Hide both layers to work more comfortably, because we are not going to use these layers yet. Select the Shine Top layer and go to Layer > Layer Style > Pattern Overlay. Click on the Pattern box, choose green_metal_pattern from the list (we are using the same background pattern), and set the Scale to 50%. Don’t forget to click on Snap to Origin. We have to add a Drop Shadow to separate the text from the background. Go to Layer Style > Drop Shadow and use the settings shown below. Go to Layer Style > Gradient Overlay and set the following values. To add a glossy look, go to the Layer Style window and modify the settings of Bevel & Emboss as shown below. You’ll need to create a custom contour curve. Follow the images carefully and use the values shown in the right column. Go to Layer Style > Satin and use the following settings to brighten up the text. The Contour is a default curve named Cove – Deep. Now we’re going to improve the shiny metal effect by adding glow. Go to Layer Style > Inner Glow and set the following values. The Contour is a default curve named Cone. Go to Layer Style > Stroke and use the settings shown below to brighten up the edges. We are going to add a backlight. Go to Layer Style > Outer Glow and use these settings. Now we’re going to work with the second layer named Shine Mid, so make sure you turn it on! We have to achieve a perspective with a central vanishing point. Go to the Character window and modify the Tracking value to -60 as shown below. To match the colors of both layers. Go to Layer > Layer Style > Gradient Overlay and use the settings shown below. Go to Layer Style and modify Inner Shadow using the following values. We are going to add some shadows to separate the text from the background. Go to Layer Style and modify the values of Drop Shadow and Outer Glow as shown in the images below. This final step will give a special touch to the effect. Select Shine Bot and open the character window. Modify vertically scale to 115% and baseline shift to -10 pt. Then change the color as shown below. In this tutorial I showed you how to create a striking text effect using three layers to achieve a central vanishing point. I hope that you enjoyed this tutorial and can use what you’ve learned for your own projects. Please feel free to comment and show me your results. 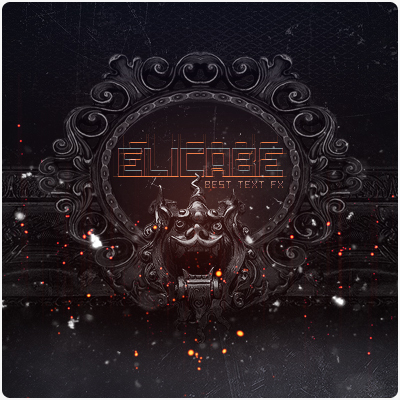 Love text effects? Find more incredible Layer Styles on Envato Market to unleash your creative potential. Browse thousands of amazing resources to find the one that fits your needs. Step into the future with this awesome set of futuristic layer styles. This pack includes 12 futuristic and modern Photoshop styles to help enhance any design. Simply add them to your Styles panel to begin using them right away! My name is Enrique Eliçabe and I'm a graphic designer with 10+ years of experience. My principal weapons are creativity, communication, and hard work. If you would like to know more about me, please check my portfolio.